Somewhere in a land far, far away is a place called Freeport, and last Saturday night my wife and I decided to get crazy and go there. We visited a bunch of stores including one famous for it’s waterproof boots and customer satisfaction guarantees. But we weren’t there just to browse at the multitude of stores filled with both Mainers and out-of-staters, we were there to consume some food and maybe a beverage or two. Fortunately, we were well prepared for that because earlier in the day, my wife took advantage of the one available reservation remaining at Tuscan Grill, just barely a stones throw from those previously mentioned stores. The interior of Tuscan Grill was very nice. The restaurant was quite large with a beautiful bar, open kitchen/brick oven, and lots of table seating. There was outside seating, though I’m pretty sure it isn’t used this time of year. We were there early and there was still a bit of a crowd, so I immediately got the impression that it was quite popular. My wife had been there previously and insisted that it was good, so I was eager to try it and hoped that my experience would be as pleasant as hers was. Only time would tell. As soon as we were seated we got to the menus. I had looked at them somewhat prior to arriving, so I had an idea what I wanted to drink. When the waitress came, she dropped off the bread, poured some olive oil, ground some pepper into it, and gave us the list of specials. Then she asked us what we wanted to drink. I ordered the Mainehattan – house infused blueberry Makers Mark whiskey, sweet vermouth, bitters and whiskey soaked blueberries. My wifette went with the House Made Cranberry Orange Sangria – fresh apples, oranges, cranberries, maine wildflower honey, orange liquor, club soda, cabernet and garnished with fresh fruit. Because I had learned from the mistakes of my last restaurant experience, I went in to Tuscan Grill underfed, so by the time the waitress walked away with our drink orders, I was ravenous. I quickly threw some bread and seasoned oil into my mouth while discussing the food with Mrs. Portlandeater. I was hoping for some wings, but my wife wanted to share a salad. I considered that option and then looked at all the pizza, pasta, and entree options. I hadn’t eaten pizza in a while, so I was leaning toward that and so was she. After some review, I decided that the pizzas in which I was most interested were sans meat. Adding a salad for my app would leave me a full night of meatlessness which sounded sad to my omnivore brain. We both struggled a bit with our choices but when the waitress came back with our drinks, we were ready to order some food. As a compromise for the salad as our app, I proposed a family-sized Caesar – romaine, radicchio, creamy house dressing, croutons, shaved pecorino romano and white anchovy – with chicken added and she agreed. However, the waitress suggested just a standard salad since the family size was enormous. I reluctantly accepted and we put a hold on the anchovies at the same time. For the pizza, I went with the Funghi – alfredo sauce, three shrooms, four cheeses, thyme, sweet onions. She ordered the Local Harvest – three cheeses, caramelized sweet onion jam, roasted butternut squash, cranberries, sage, arugula, balsamico & toasted pumpkin seeds. I was overly excited to get my food, but we had drinks right in front of us, so I temporarily settled for that. Mine was blue…very blue, so I naturally assumed that there was a truckload of blueberry flavor attached to my stately cocktail. Upon actually putting the drink to my mouth and sipping it, I realized my thoughts were erroneous as the blueberry added but a hint of flavor and the whiskey performed it’s typical Manhattan occupation of kicking the drinker right in the skull. This thing was strong and the blueberry only a side note. I liked it – it wasn’t quite what I expected, but I love whisky, so it was good with me. My wife’s libation was pink with lemon, lime, and cranberries garnishing it. After a bit of a wait, we got our salad. The single serving was indeed bigger than I expected. We doled it out to ourselves on small plates and went to work. The salad was good and the chicken very well seasoned. I felt the dressing was a little weak, but not bad, and overall, I was quite pleased. We ate like ravenous hippos and worked on the salad until it disappeared like a reverse rabbit in a hat. With salad in our bellies, we anxiously awaited the pizza. It was a little bit longer wait than I hoped for the pies, though we received a couple updates during the waiting period. When it finally showed up however, the waitress offered me a new one because mine was only the slightest bit burnt. I actually like it like that so it was fine with me, but there are probably some people that would have taken the offer as the edges were a little black from the brick oven. Nonetheless, I was ready to dig into my circle of cheese-covered crust. Before I could take my first bite, I had to let my pizza cool down. It was hotter than a Brazilian supermodel in the Sahara. My pizza honestly didn’t look like much because the toppings and cheese didn’t add any color. After a couple minutes, I was ready to try it regardless of what it looked like or whether or not it would melt my face. I took a bite. It was really, really delicious. There was lots of cheese and mushrooms, so it was obviously going to be good, but the onions added some great flavor too. It was a great pizza. I tried my wife’s and that one was also excellent, though I thought mine was better. The pizza went down the hatch smoother than liquor on an ice luge and I finished both mine and the remainder of hers. I had some space left inside me and I was interested in seeing the selection of sweets. 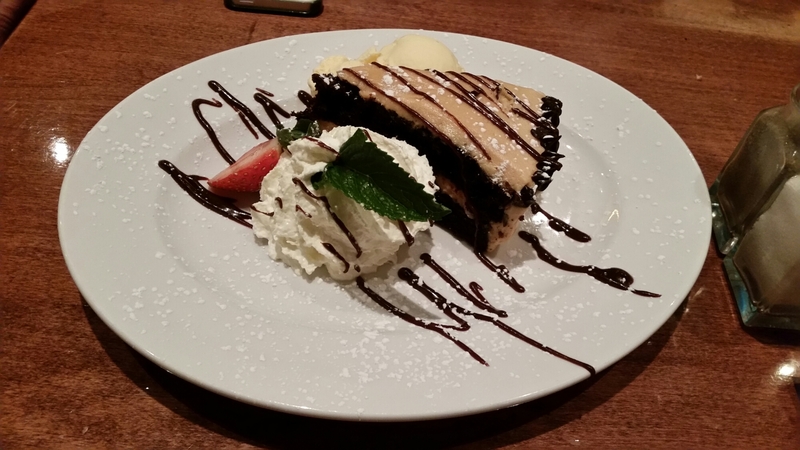 With dessert menus in hand, I only saw one that I really warmed my heart; it was the Peanut Butter Chocolate Cake – vanilla ice cream, fresh fruit, hot fudge drizzle. I’m a sucker for peanut butter and that was all I needed to see. We ordered one of those to share and got ready to do the peanut butter shuffle. Desert arrived reasonably quickly. The chocolate cake and peanut butter frosting was all I cared about. Though it was presented with ice cream and whipped cream on either side and fudge drizzle all over the plate, those were but afterthoughts to me. I forked a piece over to my mouth. It was great, particularly the frosting which was heavy on the peanut butter. I ate a little of the creams, but focused on inhaling the moderately dense cake and thick frosting which was finished in hardly a minute. Once that was done, we were done and ready to head out. When the meal was complete, we were out $87 with tax and tip. The food was quite good. We had a bit of a long wait for the pizzas, but they were delicious and quite unique. The drinks, salad, and dessert were all tasty and other than the delay, the service was on point. I would definitely visit Tuscan Grill again in the future. They definitely get busy though, so you might expect the service to be a little slow, but the food holds up and the atmosphere is beautiful. If you’re in Freeport, make it one of your stops. This entry was posted in Portland, ME food on October 15, 2015 by peterpeterportlandeater.